Car: 1950 Ford Tudor sedan V8, a milestone car in Ford history. 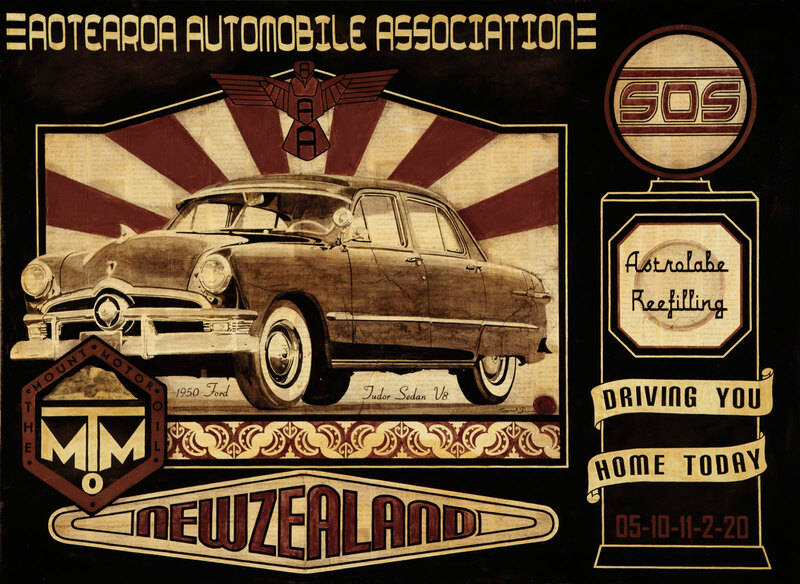 Boarder design: Based on the front of the Ford factory in Lower Hutt. Kowhaiwhai: Nga Maunga depicting mountains of Aotearoa and the link we have to them. Mount Motor Oil Logo:‘The Mount’ is the common term for Mt Maunganui which is the image inside the logo, referencing the oil that washed ashore. AAA bird logo: Inspired by the NZ wood pigeon. Various Ford vehicles were thought of as heavy and clumsy…when relating this to our native Fauna…I immediately thought of the Kereru. Gas pump:Based on the older style of pump at the top with S.O.S. (Save our souls), universal term for when in need of help.